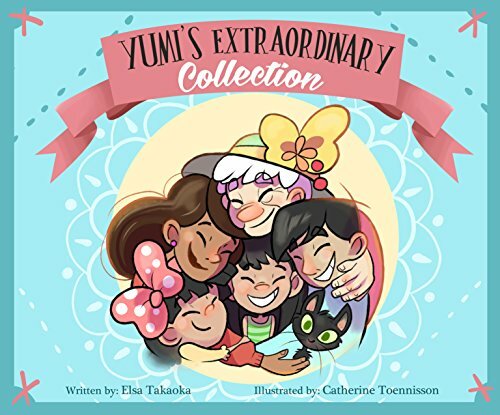 In Elsa Takaoka’s picture book Yumi’s Extraordinary Collection, the title character, a Japanese American girl around eight-years-old, is looking for the perfect collection. Like her grandmother, Yumi is a story-teller, but unlike her grandmother Sayuri, Yumi tells stories through her art. To connect with her sick grandmother Yumi begins drawing her grandmother’s stories. Yumi reaches out to extended family including aunts, parents, grandparents, and siblings to collect stories about her grandmother. Yumi then illustrates these memories. Yumi pastes the drawings in her grandmother’s hospital room. The book makes connections between multiple generations of a family and shows them supporting one another. The illustrations are also charming, highlighting Yumi’s own vibrant art and the collections of her family members from her sister’s dolls to her parent’s rocks painted to look like owls. Yumi’s art blends seamlessly into the environment around her. One of my favorite parts is the cat who appears on several pages, batting at pencils and reaching for Yumi’s drawings. The end of the text jumps from Yumi visiting her grandmother in the hospital to an older Yumi remembering her grandmother in a drawing, suggesting that the grandmother has died without ever directly presenting this information to the reader. Overall, Yumi’s Extraordinary Collection highlights a family’s connection and history in a smart and fun way. I was given a copy of this book by the author. Sara Austin is a Visiting Assistant Professor of English at Miami University. Her research focuses on bodies, identity, and power in children’s and young adult literature, media, and culture. TWITTER PARTY Sponsored by Make A Way Media: MCBD’s super-popular (and crazy-fun) annual @McChildsBookDay Twitter Party will be held 1/25/19 at 9:00pm.E.S.T. TONS of prizes and book bundles will be given away during the party ( a prize every 5 minutes!). GO HERE for more details. I love intergeneration stories! Thank you so much for sharing on the MDBD linky and for your support of Multicultural Children’s Book Day!